Your oral health isn’t all about your teeth, and neither is your smile. Your gums will also play a role in each of these areas, and people seek gum contouring treatment from dentists to address both oral health and cosmetic issues. Continue reading if you’d like to get to know the basics of gum contouring. Gum contouring is a versatile treatment that can tackle a few different issues, and sometimes it is used for cosmetic purposes. If you have an issue with the proportion of your gums to your teeth, talk to your cosmetic dentist about gum contouring. This treatment can leave you with a more favorable smile and a new sense of confidence and self-esteem. People typically discuss this kind of procedure with their cosmetic dentists when their gums take up too much of their smile, which makes the teeth look smaller than they are. As versatile as gum contouring can be, it’s often associated with cosmetic dentistry. However, some people look to gum contouring for medical treatment. If you’ve been neglecting your dental hygiene or failing to routinely visit your dentist, you might find yourself suffering from the symptoms of gum disease. The good news is that your cosmetic dentist can still use gum contouring to help you by doing away with harmful pockets between the teeth and gums. Your dentist will also seal the tissue to further protect your oral health. 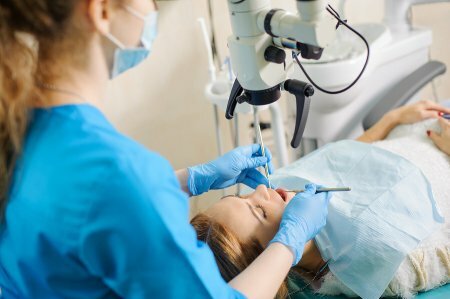 Thanks to modern technology, dentists have been able to harness the power of lasers to offer more comfortable and precise treatments. The extra precision and flexibility that laser dentistry offers can make your dentist more confident, making you a more comfortable patient. Laser dentistry can also minimize the bleeding and swelling associated with gum contouring procedures. Do you think you’re a good candidate for gum contouring? Call Glenwood Premier Dental at (732) 264-4477 to learn about our periodontists and cosmetic dentists serving Hazlet. We are happy to be able to treat gum disease and offer thorough teeth cleanings. Head over to our website for a closer look at our services.